A part of Memphis history & American pop culture~ Since 1964, known as "The Entertainment Capital of The Mid-South," the Coliseum was designed for a multi-purpose arena that seated 12,000 people. It opened in 1964, and it was the first desegregated public building in Shelby County. It was one of the few stops on The Beatles' final American tour. Elvis Presley performed at the Coliseum many times, as well as many famous performers. 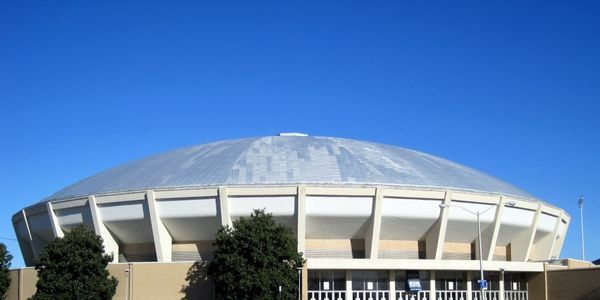 In addition to concerts, the coliseum was the home base of the United States Wrestling Association, the home of the Memphis Wings Hockey Team, University of Memphis Tiger Basketball and the home to three American Basketball Association teams. The facility was closed and moth-balled in 2006, because it failed to meet the current ADA standards. Placed on The National Register of Historic Places by The US Department of the Interior in the year 2000, this vital Memphis icon is scheduled to fall to the wrecking ball, laid out by Robert Lipscomb, Director HCD, Memphis,TN, to be replaced with yet an unnamed 150 room hotel, retail strip, apartment/multi-family housing segment, parking garage, and amateur sports fields, to name a few…. Help us Save the Coliseum and share new venues in the future. Keep our public land public and for the public…Not private development paid for by tax & bond money. Show your support by signing this PETITION ~ NOW! The decision to Deny or Approve is less than 3 weeks away! Save the Coliseum! Thank You! Memphis Fairgrounds Park has occupied 168 acres in Midtown Memphis since 1897. Since that time the park has been used for various public events and activities. Public land, meant for public use ~ Not for private ownership…housing, hotels, retail strips or parking garages. The Mid-South Coliseum has historical and cultural significance and should not be demolished. Other cites such as Nashville, Jackson, TN & Jackson, MS have updated and repurposed their older venues and kept them vital in their community - & profitable. The current plan offered by city of Memphis government is not an economically sound plan and does not represent the majority of citizens that have commented on the HCD/city plan and the demolition of the Coliseum. Save the Mid-South Coliseum.